Box foresees a significant jump in usage of its iPad and iPhone app resulting from one of the new extensions Apple will launch with the new iOS 8. 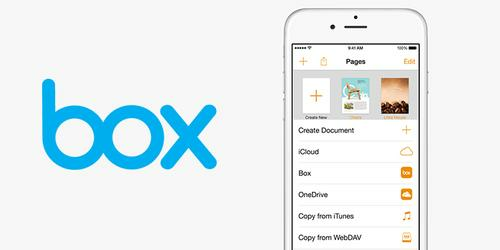 Specifically, Box is taking advantage of the Document Provider extension to let users grab files they have stored in the Box cloud storage service from the interface of other iOS apps, as well as save the files back to Box after they're done working with them. Until now, this type of integration required third-party developers to sign up for the Box OneCloud mobile developer program and build a custom link for their app using Box's proprietary SDK (software development kit). Now that this "document picker" functionality is native to iOS via its version 8, which was due to launch on Wednesday, the number of apps capable of tapping Box will balloon, Box officials expect. For the interoperability to work, the third-party apps must be modified to adopt the extensions framework and end users must have the Box iOS app installed on their devices. "We anticipate all sorts of companies will enable this for editing, document signing, annotation, or any element of their app that may want to access document in Box," said David Still, Box vice president of mobile products. Handcrafting third-party mobile app integration using the Box SDK offers more features and flexibility to developers. For example, it's not necessary for end users to have the Box iOS app installed on the device in order for the third-party app to tap their Box account. But if it's sufficient to give users access to their Box repository to check out and return files, the iOS 8 Document Extension does the trick with minimal coding effort for developers, Still said. Users of Box's iOS app will reap great benefits as well, the company predicts. "People will be able to do more with their Box content because they'll be able to use it with more apps," said Vanessa Larco, Box senior product manager for iOS. A similar, though not exact, "document picker" capability exists in Android, and the Box app for Android already takes advantage of it. IT administrators will be able to turn off this capability for their users in the Box management console if they wish, according to Still. In addition, if a company deploys the Box iOS app on user devices via an app management system, then only other centrally managed apps will have access to this "document picker" functionality, effectively fencing off Box accounts from unmanaged iOS apps. In a blog post, Box CEO and Co-Founder Aaron Levie called the new iOS 8 extension and the capabilities it brings "a huge milestone for openness and interoperability" and a "bellwether moment for openness in the enterprise." He said that GE, which is rolling out Box to its 300,000 employees worldwide, will greatly benefit, since its staff has about 80,000 iPads and iPhones. Box needs to take advantage of all the breaks and opportunities afforded to it. The 10-year old company, a pioneer in the now largely commoditized enterprise cloud storage and file sharing market, is in the midst of an evolution, as it branches out into content and document management, to grab a bigger piece of its customers' enterprise collaboration workloads. As it battles bigger rivals like Google, Microsoft, Citrix, IBM and EMC, Box is also in mid-air financially, having filed in March for an IPO with the U.S. Securities and Exchange Commission that it still hasn't launched, leading critics to question whether the company has gotten cold feet about becoming a publicly traded company. Levie has brushed off these suggestions, saying that Box never had a specific date in mind, and that it will go public when it feels the time is right. In the IPO filing, Box disclosed that it doesn't expect to turn a profit in the foreseeable future, that its sales and marketing costs have been very high so far with respect to its revenue and that only 7 percent of its about 25 million end users pay for the service. Countering these concerns and red flags, the Los Altos, California company, which has about 1,000 employees, raised another US$150 million from its backers this summer, bringing the total invested so far in the company to about $450 million.